The seminar was co-hosted by the steel solution marketing department, the wire rod marketing department and POSCO India. The product of focus was the automotive spring steel and bearing steel, boasting of price and quality competitiveness. They are to be strategically introduced to the Indian market. The goal was to design a foundation for product sales to improve on the sluggish sales of World Premium Plus products in the country. On May 10, POSCO held the first overseas wire rod product seminar in Mumbai, India. Spring steel is a material for manufacturing spring for automotive suspension and engine valve springs. It is WP+ material with which automakers require strict internal quality and surface quality. Bearing steel is a security component of a vehicle. Automotive bearing steel is a clean steel WP+ product that requires strict internal quality and quality certification from bearing customers. Many including those from 18 clients in the automotive bearing steel and spring steel industry, and the global staff of the general trading company and POSCO India, participated in the seminar. POSCO introduced the wire rod product manufacturing process and the quality specifications of each product, and the best practices in solution marketing, all of which were well-received by the audience. Also invited were Daeho P&C and Jinyang Specialty Steel which process and sell wire rod products in Korea. They had an opportunity to publicize their wire materials and steel bars which are source materials, thus creating an opportunity for domestic wire rod processors and sellers to make inroads into the Indian market. POSCO India entered into an MOU for technical assistance with POSCO India and SSS. 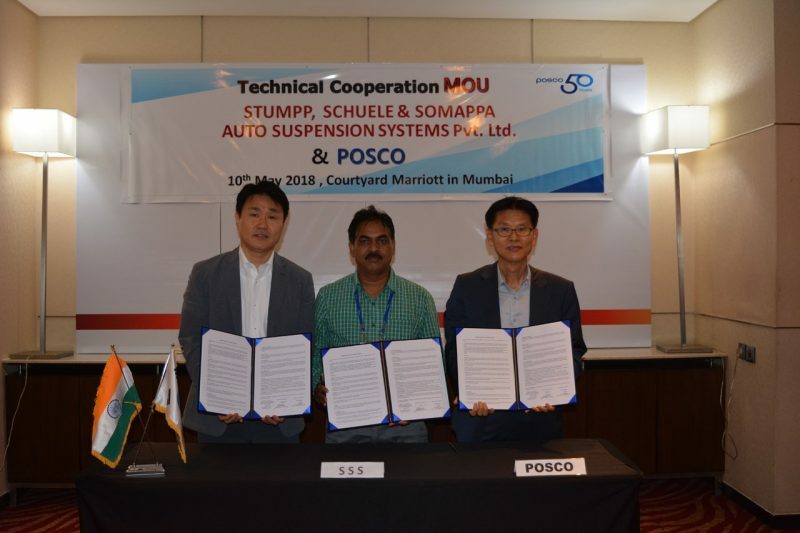 In addition, POSCO entered signed the MOU with Theis, a wire rod structural steel client, and SSS, the second largest manufacturer of suspension springs in India for technical assistance in agreement of supporting the wire rod processing technology. POSCO also held 1:1 counseling sessions with customers, and won a trial order from Theis for wire rod structural steel and from Coventry for steel suspension springs. POSCO is planning to capitalize on this wire rod product seminar to solidify its customer base for automotive bearing steel and spring steel in India, thanks to the rapid growth of its automotive industry as well as increase the overall sales of wire rod WP+ products. Meanwhile, India has produced as many as 5.12 million cars last year, has been growing by more than 10% each year in the automotive industry over the past three years, and it is expected to produce 6 million cars in 2019.